Traveling, so I needed an interview kit to stay as compact as possible. Love this setup! In the video i'm using (2) Cam-Tv Boltzen 55w LED fresnels (without the lenses installed) to flood the 5x7 collapsible white backdrop (for an infinite white setup). I placed a single 1ft Came-TV Andromeda (5600K) behind the subject for hair light (rim light). Then I placed a single 2ft Andromeda LED light in front of subject as Key + Fill. These light bars throw a very broad soft light, so if positioned correctly you can make them work as a key without harsh shadows where you would normally need a fill light I set it horizontally and slightly angled, and just moved it around until I got the look I wanted. All lights can optionally be powered via batteries if you don’t have AC access. Also for this kit, I used all reverse folding light stands. If you're not familiar with reverse folding stands, they fold differently so they fit into smaller travel luggage. My lighting was small so these types of stands work perfectly for a travel kit. For audio I used my favorite Azden SGM-250CX shotgun mic mounted on my DIY Carbon Fiber Boom Pole. Posted in dslr video on January 14, 2019 by Cheesycam. Starting with a 'Door Blank' for just $16 dollars, I now have a large desk surface to place my iMac 5K, Asus PA32U UHD Monitor, and extra Apple Display. I started with a door blank, which means there are no holes drilled for a door knob, and nothing carved out for door hinges. The door is lightweight as it's a hollow core, but solid around the edges. I chose one that had a small defect so it was hugely discounted from $65 to just $16 dollars. I then rolled on a few coats of Appliance Epoxy paint to it would be a hard glossy finish (easy to clean). Instead of table legs, I'm using IKEA Cube shelving so I can place my LACIE RAID and other hard drives. You can also add Cube Bins to store small accessories. I also drilled holes 'inside of the cubes' so I can pass wires through from one cube to the next, or run cables up and down. It keeps things tidy. Under the desk I mounted a large power strip with 12 outlets, and each one spaced to fit any weird sized adapters. This is plenty of power connectors for all my stuff. For all of the loose cables, I hung them up under the desk using special zip tie mounts. I drilled holes to pass wires through and covered with Desk Grommets. You'll be amazed what other types of Desk Grommets there are out there, including USB power adapters to charge devices if you wanted to add that. Posted in dslr video on January 3, 2019 by Cheesycam. I've been doing a lot of traveling and run-gun style shoots lately. So I wanted an easy to travel with, Ultra lightweight, telescoping, mini boom mic setup. By starting with an inexpensive Sunpak 424MX Carbon Fiber Monopod, I cut the foot off and attached a 1/4-20 threaded stud. 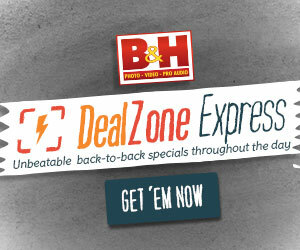 You can find these studs at auto parts stores, as they are used for building car engines. 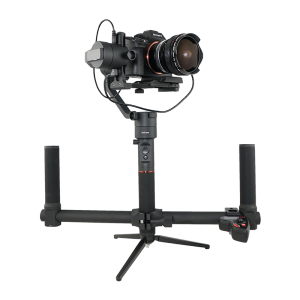 The self powered Rodemic Videomic Pro attaches at technically the foot of the monopod which adds better balance and leaves a solid handle for the boom operator. A portable recorder like a Zoom H1 is attached at the (technically top) other end of monopod 1/4-20 thread. The quick snap locks on this monopod are fast, and the poles don’t rotate when unlocked. This little bit of kit packs small, lightweight to hold, works and sounds great! Yes, I know you can create something similar with just about any telescoping pole, but my personal goal was something Carbon Fiber, thin, and with the quick snap locks. The fact that I had this monopod already saved me money as well. Posted in dslr video. Tags: diy audio, DIY boom pole, diy carbon fiber boom pole, Rode VideoMic on December 19, 2018 by Cheesycam. 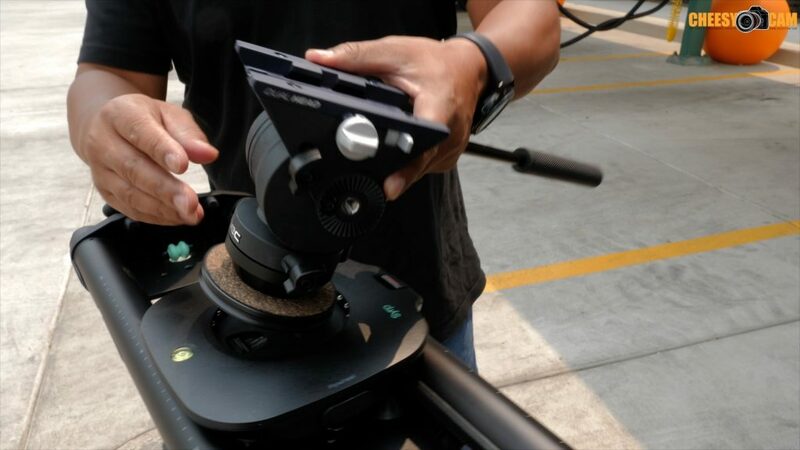 Syrp is a company well known for their motion control setups such as the Genie II and Magic Carpet slider. 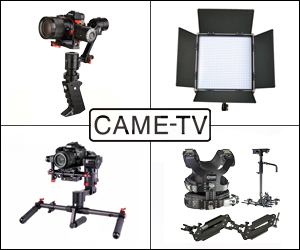 Their latest video slider the Magic Carpet 'Pro' has been designed to produce supremely smooth tracking moves with much heavier camera weights of up to 70lbs / 32kg. 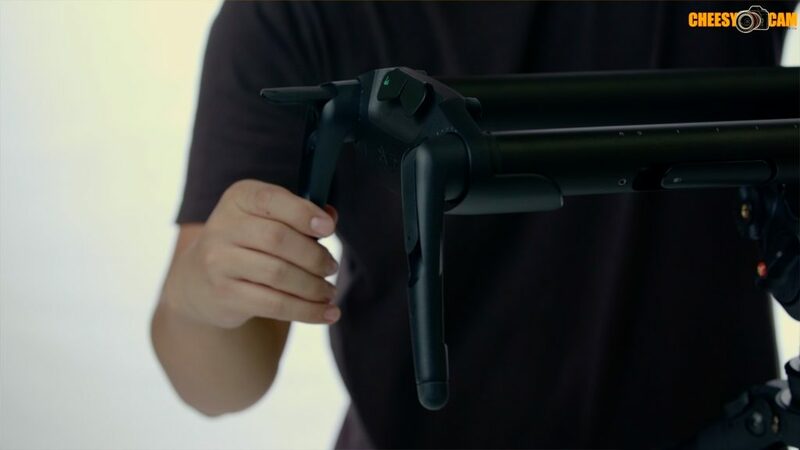 The new design incorporates tool-less set up with the added benefits of an integrated Flywheel, a patent-pending Quick Release System, and the ability to connect multiple Tracks together for longer tracking movements. There are no loose parts that could potentially get lost during setups. No thumb knobs, no drive belts, etc. The Carriage-integrated Flywheel keeps your tracking shots smooth as it ramps up rotation and ramps down at the end of your movement. Best of all, the flywheel can be de-activated with a press of a button. Each Magic Carpet Pro comes with precision-machined Track Joiners, enabling you to infinitely add length. Adding or removing a set of extension rails is simple and quick using just a locking lever. 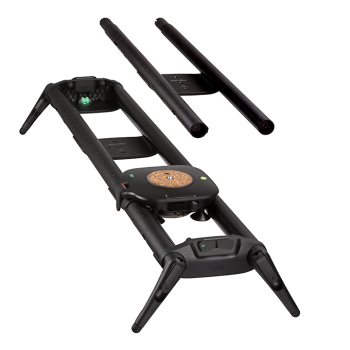 The Magic Carpet Pro legs (used for leveling on an uneven surface) also attach at the end of the rails through locking levers, and adjustments of each leg of the slider adjusts quickly through a locking lever of it's own. 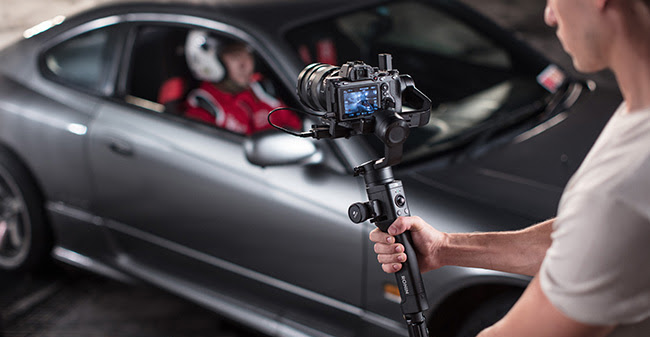 The Quick Release System attaches to your tripod head so that you can setup or pack down with ease. The End Caps work with the classic rope system design to be used with the Syrp Genie or Genie II for integrating motion control. At each end is a small roller wheel that can be used to attach a counterbalance weight when going vertical with your movements. The Magic Carpet Pro slider is available in a 2' (60cm) and 3' (90cm) length, and a combo package which includes both 2' and 3' rails is also available for up to 5' of travel. 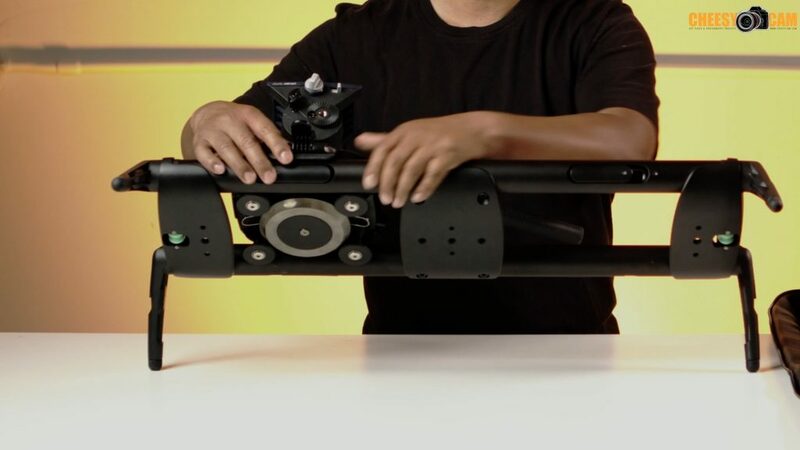 You can find more information about the new Syrp Magic Carpet Pro video slider (here). Posted in dslr video on August 3, 2018 by Cheesycam. 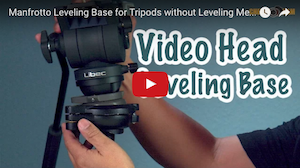 Here's a look at one my favorite lightweight gimbals as of late, designed for popular small cameras such as the Panasonic GH4, GH5, GH5s, or even the Sony A6500. The Moza AirCross is lightweight, packs up small, but most importantly has performed flawlessly over the last several months on every project i've used it on. In fact a few of my friends who have tried this gimbal with their GH5 cameras have also opted to switch to the Moza AirCross. The Moza AirCross can support payloads of up to 4lbs which is enough for most mirrorless interchangeable lens cameras using native lenses. The AirCross has a 12 hour battery life, but as an option you can power your camera from the gimbal using a dummy battery adapter. Taking it one step further, you can actually power the gimbal from an external 12V battery if for some reason you think you'll need unlimited runtime. One thing I didn't touch on in my video is the Moza Assistant smartphone App. This app has a nifty feature that allows you to use the Moza AirCross for 2-Axis motion control timelapse. 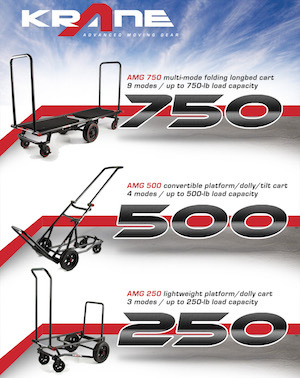 As you switch between a lighter or heavier payload, the Moza AirCross also has built in Auto-Tuning to eliminate any vibration or oscillations normally caused by too little or too much power to the motors. 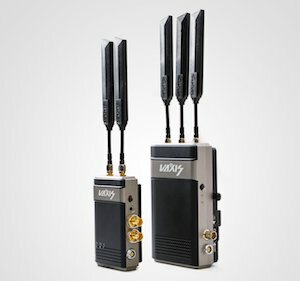 The wireless remote utilizes accelerometers and Gyros. 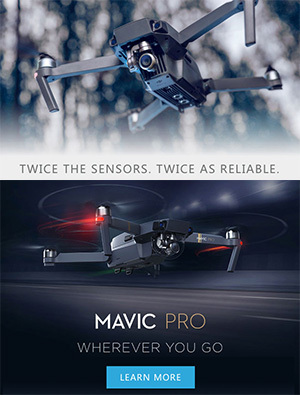 These built in sensors allow the remote/gimbal to mimic the movements of the operator. 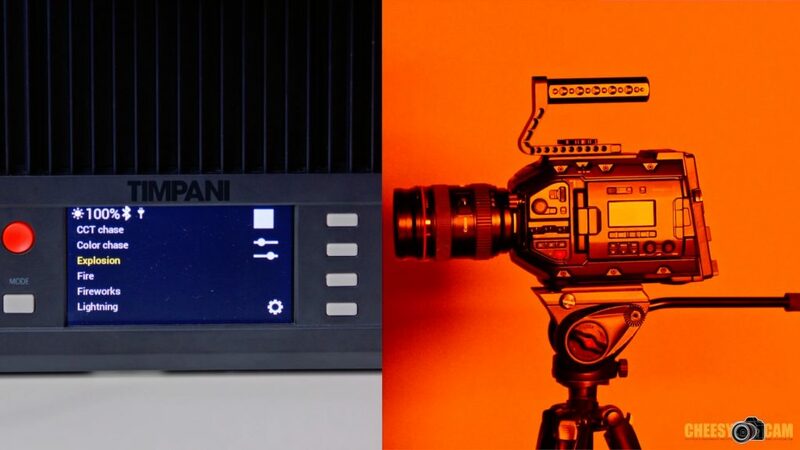 Just by physically moving the remote you can control Pan, Tilt, and Roll from up to 50 meters away. If you're working with the smaller camera setups (under 4lbs), I see no reason why you shouldn't consider the Moza AirCross. Posted in dslr video on August 1, 2018 by Cheesycam. Mark my words, 2018 is going to be all about RGB (multicolor) LED Video lighting. 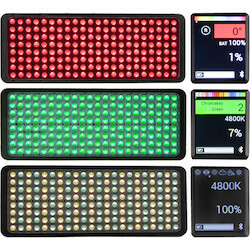 On this topic, here's an overview of a new set of portable RGBAW LED lights from Luxli called 'CELLO'. The CELLO is a new 10" light, and somewhat similar to the 5" VIOLA. If you haven't already seen my earlier video review on the VIOLA, you can see that video (here). 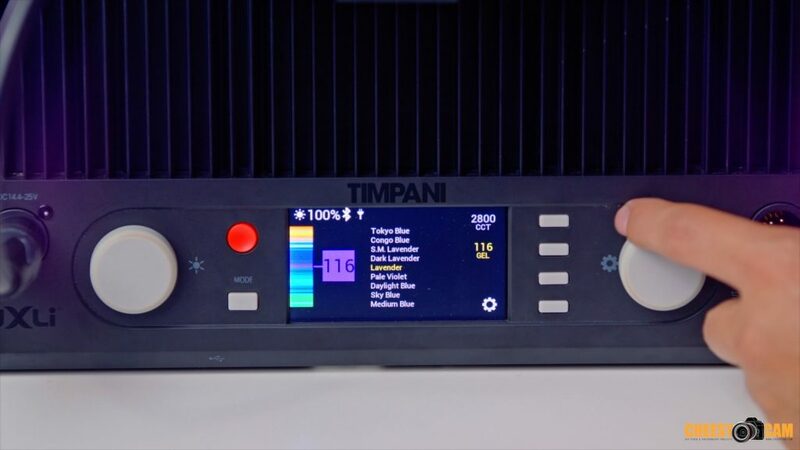 While similar to the original VIOLA, the CELLO LED has a new feature for choosing Colored Gels through it's menu (or through smartphone app). This feature adds a new dimension for being able to select a very particular RGB color, and also being able to repeat the choice in the future. Most other RGB Lights have very basic controls for RGB, and not quite as refined as Luxli has done with all of their products. While I haven't done any testing on output, these 10" RGBAW LED Lights put out a good amount of power. Luxli rates this as 24W from this 176 LED panel. Below i've embedded a BTS clip where we used (2) Cello LEDs on one side of this truck, and (2) Viola LEDs placed under the truck. These small lights were more than enough to accent this large vehicle. 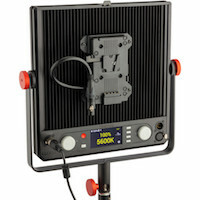 In the final video, we used a 1x1 Luxli Timpani panel light only to to hit the back wall. You are able to control most of the features directly from the CELLO light itself, but there are more functions available when using the iOS App. Here you can control lights individually, and also in a group. Other FX features become available such as strobing and cycling of different hues. One example I have used this feature on is to simulate a television screen. And regardless what color you choose, or how much you dim the light, they remain flicker free at the shutter speeds I have done up to 240fps. 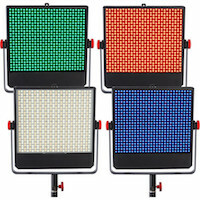 Overall these lights have completely replaced the workflow I would have to do working with sets of colored GEL sheets. Not only speeds up production, but also keeps things neat and tidy. 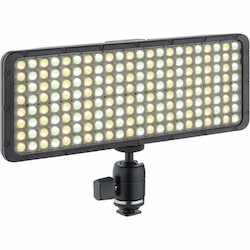 All of the Luxli LED lights I have used feel very durable, and I highly recommend them if you're looking to start working with more color on your projects. Posted in dslr video. Tags: cello, luxli, luxlilight, rgbaw, timpani led light, viola on July 10, 2018 by Cheesycam. The Ronin-S gives independent filmmakers the power to capture spontaneous moments with clarity, smoothness, and a refreshing perspective. Posted in dslr video on May 29, 2018 by Cheesycam.